The Kerch Peninsula is a major and prominent geographic feature located at the eastern portion of Crimea. Stretching towards the Taman peninsula, it is reminiscent of an isthmus between two neighboring seas: Azov Sea and Black Sea. On the most of the part of the peninsula is located the Lenine Raion. 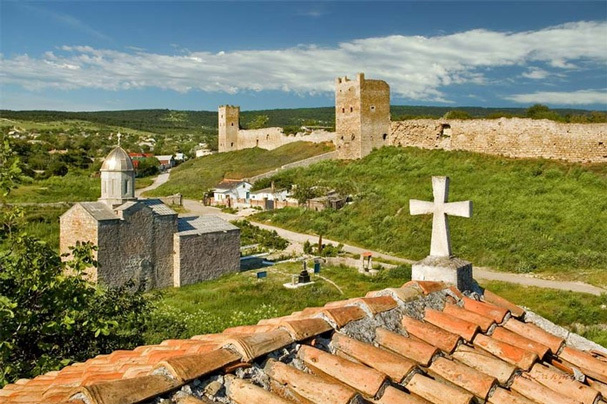 The peninsula is almost completely surrounded by water and only to the west connects with the rest of Crimean peninsula by the Aqmanai isthmus which is only 17 kilometres (11 mi) wide (from the southern end of the Arabat Spit to the town of Primorsky (Khafuz), Feodosiya). On elevated portions of the isthmus, named after the village of Kamianske (former Aq-Monai), are seen both of the surrounding seas. The southern coast of peninsula is washed by the Black Sea and the Bay of Feodosia, to the east as a natural border serves the Strait of Kerch, while the northern shores are part of the coastline of Sea of Azov, Kazantip Bay, and Bay of Arabat. Away to the northwest from the peninsula runs another isthmus known as the Arabat Spit (locally Arabat arrow) which separates Sivash (Rotten Sea) from Azov Sea. 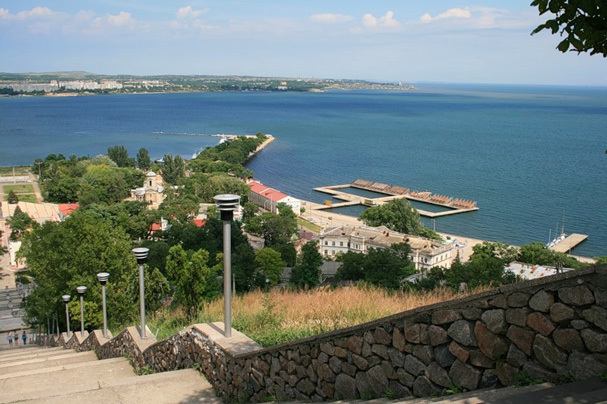 Other prominent features of the peninsula are the Mount Mithridat located in the east at the shores of Strait of Kerch and the Ararat Mountain (175 metres (574 ft)) located just west of the Kerch city, both of which are part of the northeastern elevated region. At the southeastern portion of peninsula are located mountains Sosman and Kharuchu-Oba. The highest mountain on the peninsula is Pikhbopai that is part of the Mithridat crest and 189 metres (620 ft) tall. 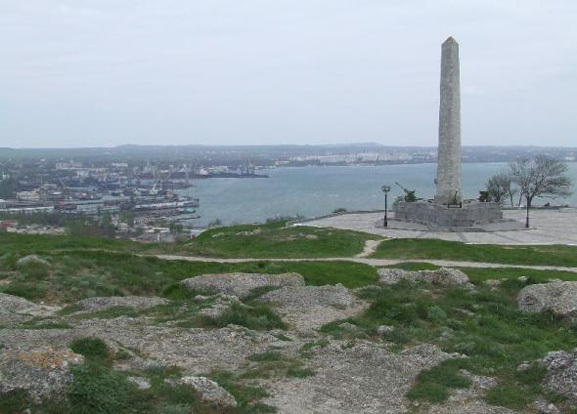 Eduard Ivanovich Totleben – one of the most famous people in Kerch , in fact, he built on the shores of the Kerch Strait one of the seven most powerful fortresses in the Russian Empire – a fortress Kerch. Edward I. was born in 1818 in Mitawa Russian Empire (now Latvia). Totleben were old Thuringian family of sorts that had already enough fail . Descendants of the famous Russian general and Count Totleben (18th century) began to do business , and his father Edward Johann Heinrich became a merchant of the second guild . Eduard Ivanovich Totleben entered the St. Petersburg Engineering School , but heart disease prevented him to listen to the end of the course . After he entered the Riga engineering team , and in 1840 became a study in Battalion . The training battalion for the young Edward noticed General Schilder who instructed him to do mine tubnoy system. To study this system Totleben sent to Kiev, where he took charge of the manufacture in large sizes experiments underground works . After 8 years , from the date of enrollment in the Battalion , Eduard Ivanovich went to the Caucasus , to participate in expeditions. He helped the successful progress of the siege Gergebil worked on strengthening Chokh siege . Returning from the Caucasus Totleben was appointed adjutant general Schilder , and since 1851 he settled in St. Petersburg. In 1854 Totleben was sent to the headquarters Army of the Danube , where ran errands Adjutant General Schilder . He managed to make a brilliant reconnaissance under fire Turkish batteries and develop a plan of attack fortifications in Calafate . Before the beginning of the siege of Silistra Totleben appointed Major trenches . After the siege of Silistra Eduard Totleben transported to Sevastopol for the defense of the alleged landing of the enemy. The widest portion of the peninsula is between the Kazan-Tip Cape (north) and Chauda Cape (south) that are apart 52 kilometres (32 mi). The length of Kerch peninsula is over 90 kilometres (56 mi) from the western portion of Aqmanai isthmus to the Fonar Cape. The total area of the peninsula is only 2,830 square kilometres (700,000 acres) which is just over 10% of the total area of Crimean peninsula.